Columbia Wetlands . . . elk, moose, bighorn sheep, deer, shorebirds, raptors and waterfowl. Good viewing all year round. Access by paved road. Premier Lake Provincial Park . . . spawning rainbow trout, waterfowl and raptors. May and June are the best viewing times. Access by secondary road. Kikomun Creek Provincial Park . . . spawning kokanee, elk, deer and western painted turtles. Best viewing of spawning kokanee is during September and October. Elk and deer viewing during February, March and April. Turtle viewing is best in July and August. Access by paved road. Kootenay National Park . 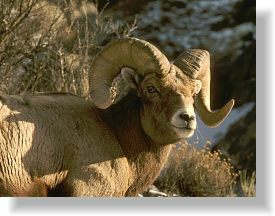 . . mountain goats, bighorn sheep, elk, black bears, mule deer, wolves, raptors and songbirds. Good wildlife viewing year round. Access by paved road. Elko . . . deer, mountain goats and bighorn sheep. Good viewing all year round. Access by paved road.